We're excited to announce the long-awaited 4th installment in Jack's story will be available for Digital Download June 6th, 2018! Issue 4 Digital Download Coming Soon! Issue 4 DIGITAL DOWNLOAD is almost here! We'll announce the official release date (as well as the pre-order for the ISSUE 3/4 DOUBLE DIGEST) next week! The Saga of the Jack of Spades No. 3 coming August 2nd, 2017. While we slave away at issues 3-5, we'll be taking a short break from posting content after Issue No. 2 wraps up. 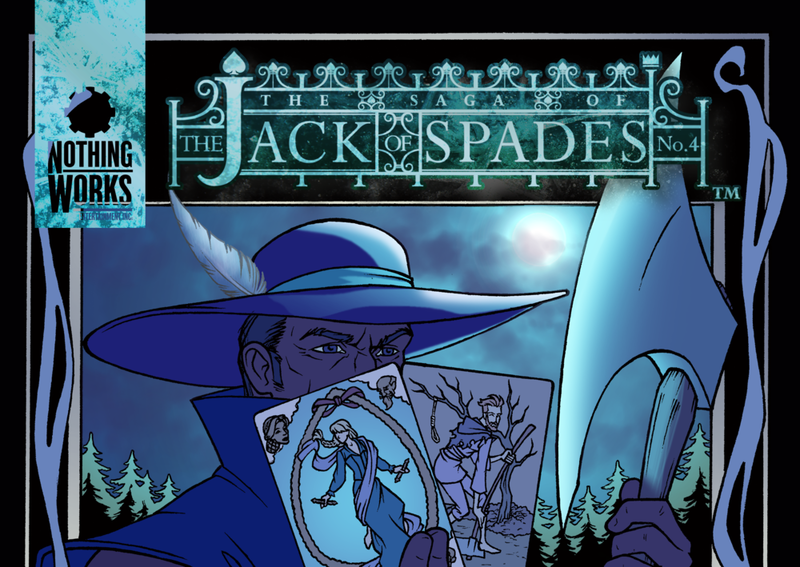 Until then, enjoy a brand new page from Issue No.2 of the Saga of the Jack of Spades WebComic! Two more free pages revealed! Capping off Jack's assault on the Euchre hideout with two more pages from Issue No. 2 of The Saga of the Jack of Spades Web Comic! Friday Page and Issue 3 Update! Our colorist/creator (colortor?) is doing a bang up (albeit slow) job of getting Issue 3 out in time for the Panel One Festival. Here's a preview of the progress. The Official Home of The Saga of the Jack of Spades, the young adult comic about the story behind the deck of cards. Sign up with your email address.